American Airlines have 22 aircrafts planes of this type. Boeing 787-9 is the latest airplane that has supplemented the fleet of American Airlines. This airplane may transport 285 passengers in three classes: business, premium economy and economy. American Airlines also separates main cabin extra type of seats. First 8 rows are the seats of business class. There are totally 21 seats here. Close location of the galleys will cause discomfort to passengers of the seats of the 1st row, 7DH, 8A and 8L. Lack of floor storage during take-off and landing is another disadvantage of the seats of the 1st row. Behind the exit row 21 seats of premium economy class are located. There are 3 rows of seats here that have 2-3-2 configuration. The noise from the galley and lavatory located in front may represent a problem for passengers of the seats of the 9th row. Also these seats have no floor storage during take-off and landing. Next 3 rows contain seats of main cabin extra type. There are totally 27 seats here. The only disadvantage of the seats of the 12th row is lack of floor storage during take-off and landing. Behind the seats of the main cabin extra type 75 economy class seats are located. 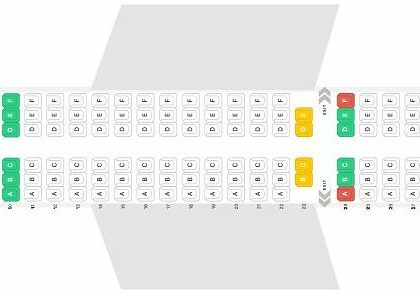 Passengers tend to gather in the area of the seats 22ABC, 22D, 22H, 22JKL and 23DEH in order to visit lavatories causing discomfort to passengers of these seats. Also the seats 23DEH are less reclining than standard. Behind the lavatories, galley and exit row one row of main cabin extra type is located. These seats have 3-3-3 configuration. 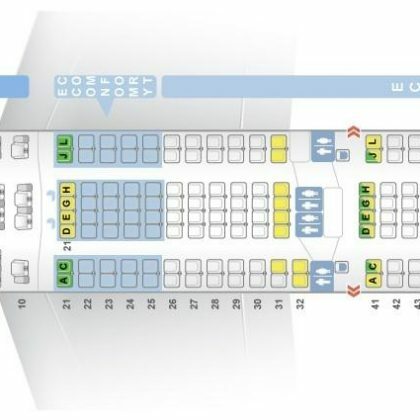 Location of the galley and lavatories in front of the seats of the 24th row and lack of floor storage during take-off and landing are the disadvantages of these seats. The last 15 rows of the airplane contain the seats of economy class. Most of these seats are standard. Lavatory and galleys located nearby are the main disadvantage of the seats 37D, 37H, 38D and 38H. This disadvantage in addition to limited recline makes the seats 37ABC, 37JKL and 39DEH bad seats.